The leaves look a little like a violin, however it is the hardy nature and grows well both indoors and outdoors. These are an easy care plant that is is used as foliage plant. The large wavy edged waxy leaves reach nearly 1/2 m in length and provide a strong architectural element to this plant from West Africa. It is a species that is used to a warm climate, so although outdoors is recommended, this is for warmer climates, and certainly frosts. 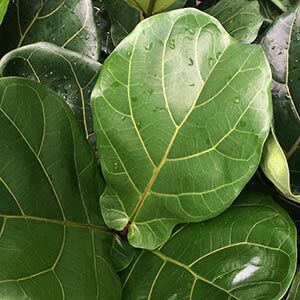 The Fiddle leaf fig is mainly grown as an indoor plant in Australia, and although the foliage is large plants can be pruned to size. In commercial indoor planting pot size is restricted to help control height. As with all indoor plants the foliage does get a little dusty over time, and this causes a few problems. Dust will make it difficult for plants to transpire and can also lead to fungal diseases. So the remedy is wash the dust off. You can do this by placing the plants outside on a warm rainy day and let mother nature to the work for you. Or you can use a soft cloth and water to give the plants a gentle wash down. Problems can include Leaf Drop, usually a symptom of under watering or over watering. However also caused by cold drafts and being to warm. Watering regime should include a period between watering where the soil is allowed to almost dry out, these are not a plant that like to be water logged. How do I know if my Fiddle leaf fig Needs Watering.? Lift the pot after watering, and feel the weight. when it feels about half this weight it needs watering again. You can water outside with a hose which washes the leaves as well. Water for 2 – 3 minutes and then let it drain thoroughly. Never let the pot sit in a saucer that has water in it. You can also mist spray every day or two in very hot dry climates. Under watering – Usually brown leaf margins, around the edges. Overwatering – Usually brown spots occur in the centenaries of the leaves this can cause anthracnose which is a fungal disease and it may need two be treated for this. You should also remove leaves affected by anthracnose. Red spots on the the leaves are usually caused by insect pests such as, spider mites. Over time the root system will fill the pot and begin to creep out the drainage holes – Time to repot into a larger container.